The purpose of the present study was to evaluate the ranges of Hounsfield unit (HU) found in body fluids, putrefaction fluids, and blood on postmortem CT and how these ranges are affected by postmortem interval, temperatures, and CT beam energy. Body fluids, putrefaction fluids, and blood from a total of 53 corpses were analyzed to determine the ranges of HU values from postmortem CT images that were taken prior to autopsy. The fluids measured in CT images were obtained at autopsy and examined in terms of macroscopic and microscopic appearances. Body fluids and blood were also collected in plastic bottles, which were subjected to CT scans at different beam energies (80–130 kV) and at various fluid temperatures (4 to 40 °C). At a postmortem interval of 1 to 4 days, the ranges of HU values of the serous fluids (13–38 HU) and the nonsedimented blood (40–88 HU) did not overlap. In the sedimented blood, the upper serum layer exhibited HU value ranges that overlapped with those of the serous fluids. The putrefaction fluids exhibited a range of HU values between 80 and −130 HU. Elevated HU values were observed in fluids with accretive cell impurities. HU values decreased slightly with increasing temperature and CT beam energy. We concluded that serous fluids and blood in fresh corpses can be characterized and differentiated from each other based on HU value ranges. In contrast, body fluids in decomposed corpses cannot be differentiated by their HU value ranges. Different beam energies and corpse temperatures had only minor influences on HU value ranges and therefore should not be obstacles to the differentiation and characterization of body fluids and blood. 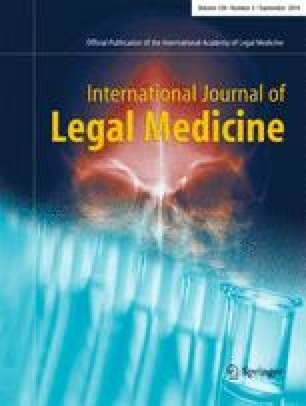 The authors would like to thank the team of forensic pathologists and forensic autopsy technicians at the Institute of Forensic Medicine Bern for their support in handling the cases.